How to: Make your own "skype out"
The link of a PC at a ham-station to the PC of the operator through the Internet is not the biggest problem: DSL on both ends makes a useable transfer-rate of 128kB/s. The download-rate is much higher (ADSL) but it's not feasible because the upstream of one computer is the downstream of the other one. Most likely on the operators side there's an internet-connection. A wired phone-line on the side of the station is presently a pre-condition. A Cellular phone is (still?) too expensive. 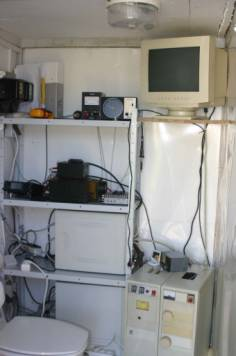 What is necessary for remote-controling a ham-station? 1. TRX-control: There are so many solutions for so called "CAT-Control-Software"; e.g. "Hamradio Deluxe" by HB9DRV and PH1PH. It's a freeware and its development is very fast and alive. HB9DRV is working on a full-remote package which is not currently available. A part of the "HRD" is a rotatorcontrol-interface that is very useful for our project. 2. PC- remote controlling: The most popular solution for remoting via IP is "VNC". The implementation is easy. You only have to know the IP-adress and the port. In this case I use "Ultra VNC". There are many commercial solutions available over the internet. I also reviewed RADMIN. It's much faster than VNC however it's a shareware, not a freeware like VNC. 3. Rotator-control: A well known and stable solution is "ARS". The hardware has to be connected to a LPT-port of a PC. Which in term connects with (almost) all known rotators with DC-feedback is easy to use. You'll find all details in the very good manual. In my case I had a problem of a "0V-transition" of the feedback-voltage that comes from the potentiometer of the rotator. You can solve it with a seperate DC-source of 20mA. The unit for manual control of the rotator works in this case only as a power supply. 4. Binary switchings: The switching of relays via software is an old problem. Yet with the implementation of "Windows XP" or "Win2k" it's still present. The handling of LPT-ports or COM-ports with these OSs is not as easy as before. I found two programs: Z-ParSwitch and DIYK. Z-parSwitch has the advantage as you can use it with parameters from a command-line (at the prompt) as well as with a graphical interface like "DIYK". The hardware for the 8 relay stages including drivers on a board is not expensive. 5. Transport of modulation: This was the biggest broblem in the past. "How is it possible to transfer the modulation to the AF-input of a transceiver and how listening the AF in case of RX?" A very popular tool is "skype". This "Voice-over-IP" (VOIP) software is also a free telephone option for an internet-user. Compressing an AF-stream for the digital world of internet is hard work for the CPU. The minimum requirement should be at least a Pentium III. The audio-quality is just like "ham-defined", I tried to transmit an EME-signal that I decoded with -23dB in the local PC with skype through the internet to my "HAM-PC" and I discovered an additional loss of only 1 dB! 6. Getting feedback: For a safe and stable remote-control of a ham-station you need a lot of information about it's status, PTT-status, Power Amplifier-conditions, antenna-direction, SWR etc. For the sake of efficiency I used two cameras: one for the shack (it's an ordinary USB-cam) showing SWR, PTT and exhaust temperature of the PA and another one (it's a small water protected video-cam) in the antenna-frame. This camera looks into the direction of the antenna. If there is clear sky you can also see wonderful pictures of the moon. Weather-webcam is included! There is so much usefull software for televising over the internet. I chose "WebcamXP". This package includes a http-server which makes it much easier to publish the video-stream. 7. High quality station clock: I suggest "Dimension 4" as it is easy to use and well tested. After assembling all the needed components the actual work can begin. The handling of so many details is a complex task, therefore I want to describe some of my own experiences. Let's start at the beginning: "switching on" a Station 70 miles away. Every ham station has a physical main-switch. We need to be able to trigger it remote contolled. It should be a solution with a redundancy. That means it should work without an active internet connection. This can be very important in case of brake down of Internet or PC-crash at the station. In these hazardous-situations I can switch off all station equipment only by using the function of the telephone-line. I found a cheap "Teleswitch". It's a one-channel 230V relay - switch connected to the telephone-line. For higher currents it's better using an additional contactor for switching the circuit of the ham-station. In case the station is not in use, it's sleeping. The computer is off and can not be hacked. As well as there is no current is running and everything is safe. When you want to go on air you switch on the station using the telephone. Dial the number of the station and key in a 4-digit password into the telephone-pad instead of using the main switch in the local case. After getting the command "on" via the telephone-line the station wakes up and the computer has to boot and will connect automatically to the internet. Many motherboards offer in the BIOS the possibility (chapter "power management") of automatic restart after power loss. However in my experience, that after a long periode of no voltage the board forgets this setting. I discovered a better way in the service manuals of the ATX power supplies: connect the pin "PS_on" (green cable in most cases) to ground. The process of booting should be safely started after power on at the AC-side of the PC power supply. Now Windows is booting and our smile freezes again after some seconds: The OS triggers an all ports scan (LPT, COM, USB) during the start-up looking for new components. The result is wild switching of all connected units. The "high energy consuming parts" of the radio-station (i.e. PA, Rotators) could crash during this phase. Another issue is the stability of Windows. What happens if Windows crashes or shows a strange behaviour, and you are too far away to press any button? The solution I found is to use a "watchdog board". It's a hardware for a PCI-slot that initiates a reset to the corresponding jumpers of the motherboard if the OS doesn't work properly. However this feature is not sufficient for our need. On the watchdog board (I'm using a product of company "Quancom", I found a low cost clone of it in the Internet) is also a green light indicating the accurate working of the OS. For generating an electronic signal I integrated a small circuit with an OA as a comparator. It's watching the voltage on the green LED. A following relay switches the 12V-line of the computer to the periphery if all the software is working well and the LED is lighting. There are "open collector stages" for the power consuming parts of the station. They need 12V for working. If this voltage is switched off, neither relay of the PA can switch nor any other relay of the rotator interface. With this "enable-signal" we added the necessary security during the work of Windows and we also made the boot- process harmless. The software of the watchdog board is a Windows service, yet the best way is not starting it automatically during boot-process but by a command in the end of the starting-staple file. The command-line is: net start "<"name of service">" The computer at the station is a second hand one with a Celeron III 1200 (socket 370), 512 MB RAM, a small HD (6GB), Soundcard, TV-card for the video-cam, Network, 2xUSB1, 2xLPT, 1xCOM for the PTT-signal. The OS is Windows XP, SP2. An additional case-fan (80mm) and a over-dimensioned CPU-fan care for good cooling. Nobody needs a silent solution here!!. Pic2: Antenna is pointing west. Note, how much free space there is! A water proof control enclosure is located on top of the mast. Inside is a place for the low noise pre-amplifier, the pin-diode relay for switching transmit-receive, the wiring of the camera and rotators and it's own power supply. Pic3: The re-built mast works just like a flagstaff. On left you see a secondary mast and one wire cable leading to the top of the ex-railway overhead contact line mast and another one coming from a winch about 5m away. With this winch I can raise and lower the mast. 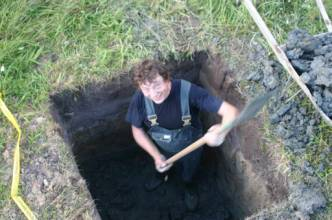 Pic4: The Author is digging the foundation pit. It measures 1.2 x 1.2 x 1.5 m.
Pic5: The remote-shack in a 4 stage shelf just behind the lavatory. Top-stage: rotator-units, 2nd stage, left to right: TRX IC706MKII, main power supply 12V, brick-PA, 3rd stage: empty PC-case for the interface-stages and wiring, bottom stage: remote controled PC. On right side beside the shelf is located the tube-PA with GS35. On it's top you see the shack-camera scene: SWR-meter, digital thermometer, LEDs for PTT-status. The principle switching is shown here. Now that everything works in the remote station the last step is to connect it to the internet. This is a relatively minor step, as we only need an address in the Internet where we can reach the computer. The most popular solution to that problem is a "DYN-DNS- Service". I tested a few of these low-cost or free services and I found that there can be a problem with stability of the name-server. So I choose a different route: I ordered a static IP- address. It's not as expensive as in the past. A volume rate (about 3 GB/month) is sufficient for our needs. The service "fastpath" is also a valid option, in Germany as it costs only 1Euro/month. To link the computer to the internet I used a small router with integrated DSL-modem. The included software-package also offers a firewall and the possibility of port- forwarding. These services are very helpful as they protect our network from being hacked over the internet. The usage of a WLAN-solution is detrimental due to the conflict between the RF of our station and that of the WLAN. In my case the router crashed several times after service-routines of the provider. I added a Monoflop circuit with a 555-Timer that makes a 2-second reset-signal for the router. During this time it gets a 230V- voltage brake with every "switching on" of the station. After the power- brake the router resets and gets surely a new Internet Connection. The last step in our process is the implementation of the PC-interface for the transceiver. There are many solutions for this available over the internet (look for sites offering products with digital modes such as FSK), my choice is the kit of Bernd, DL9AN. It has a good relation of costs versus performance and allows the potential-free transmission of AF for transmit and receive. The link to the CAT-in/output of the transceiver an USB-Port is used. Therefore we need the following ports: one USB-Port, the sound in/out ports and the com-port for PTT-logic. 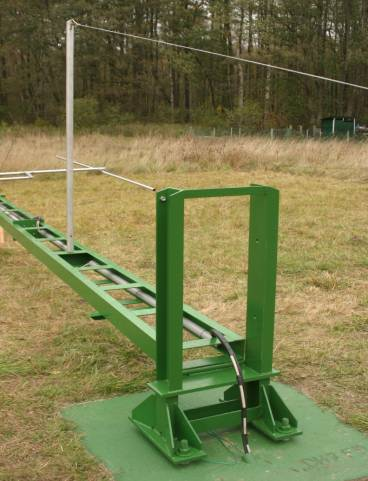 Modes: Our remote control station supports all modes:. CW: sorry for the "basic freaks":I haven't tried the interconnection of a keyer via internet to the transceiver. In this case I use for transmitting "CWType".For receiving you may decipher it by yourself or try "CWGet"! Phone:SSB, AM, FM: all works properly with "Skype".An ordinary PC-headset is connected to the PC of the operator, on the station side I adjusted the AF level only one time. A skype-included sound control rejects the transceiver well. Digital modes: The software for these modes (i.e. FSK, SSTV…) is installed on the station-PC and remote controled with i.e.VNC . Use caution as "real-time-waterfall-diagrams" such as in "MixW"; utilize a large amount of bandwidth. "WSJT" avoids this problem by using only a still picture for the waterfall. 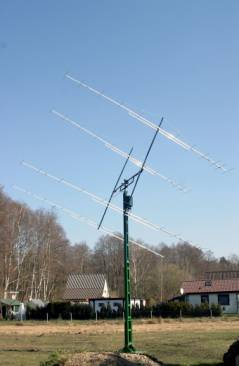 My station is a special one for EME and Meteorscatter on 144 MHz, so WSJT is used in most cases. The station can be anywhere in the world as long as you have an internet connection. 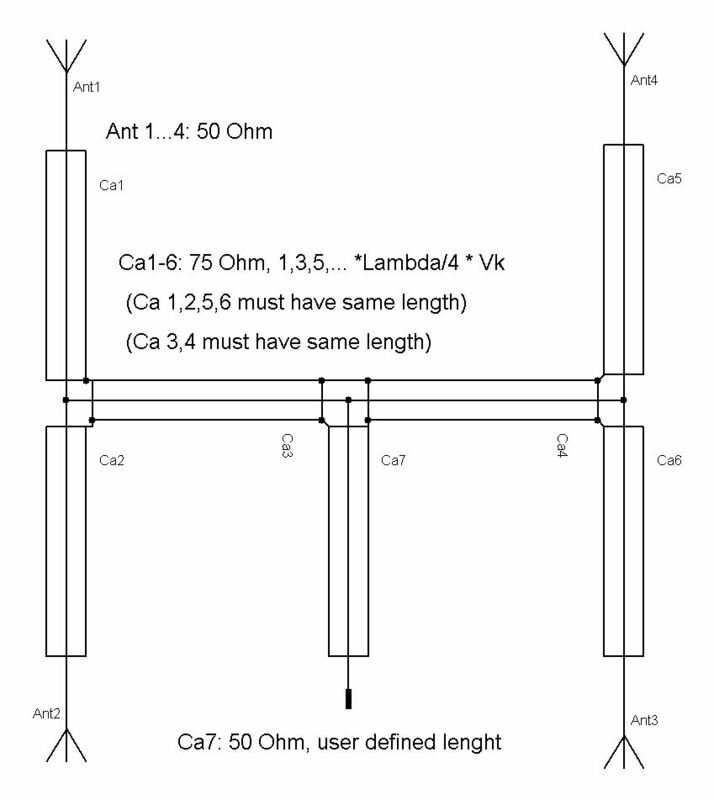 Therefore I was able to build the "antenna of my dreams": 4x4 WL (12elements) DK7ZB with gain of 20dBd - see pic 2 I also realised the DK7ZB-feeding only with cables without any impedance changer. 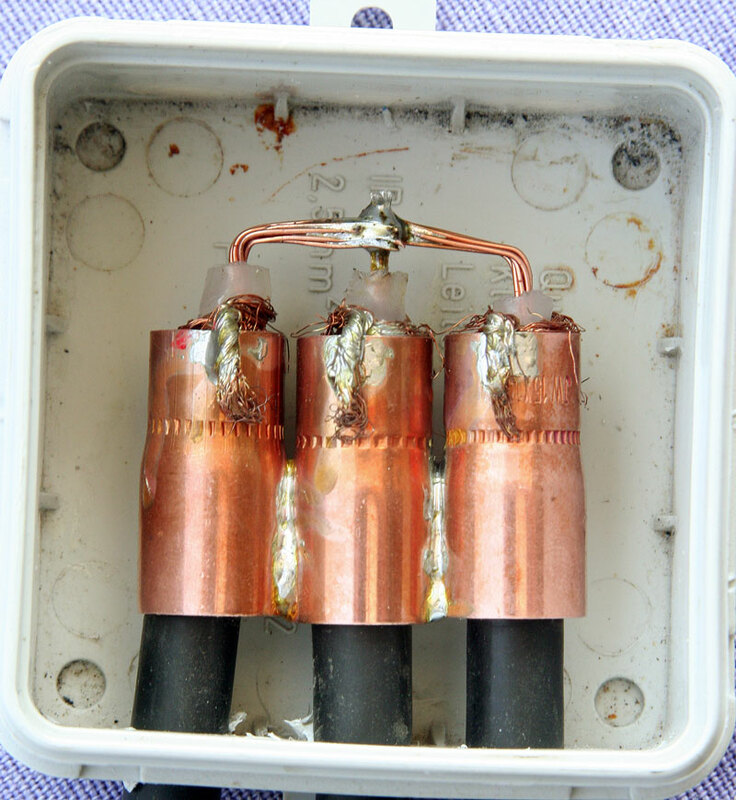 The realisation of the cable split points is shown here . The tower I used was once a mast of the railway overhead contact line (pic 3). The equipment is mostly second hand and refurbished (pic. 4). The "shack"is located in a steel-container next the serviceable lavatory (pic. 5). Therefore the implementation of an inhalation-feedback is not recommended! The electronic hardware can only work in a strict temperature range of : 5°C-30°C therefore you should insolate the shack and use a heater and a fan with temperature-control. The power control of the RF-output is possible in various ways. I chose the most simple one by controling the AF-out with the soundcard-mixer of the computer. The transceiver is connected to a small "brick-PA" with an output power of 70W in maximum. I can add (as an option for working EME) a tube-PA including a GS35 with relay-stages. The transceiver I use is a IC706MKII. The frequency-stability of the transceiver is very important for the WSJT-JT65 mode. I experienced trouble with a drift of about 30Hz per minute during receive-period. That's too much for this mode. Partial solution was achieved by the installation of a heated and controlled crystal unit to the transceiver.After modifying the fan-control in TX and RX the frequency drift was below 5Hz per minute which is adequate. The drift-measurement is important in achieving good results in EME-QSO's. Take "Spectran" (also included in WSJT-package), tune the transceiver to a beacon and look at the waterfall-diagram on the screen of computer: The line must be stable within a 5 Hz margin, even if you transmit for 1 minute in "Split-mode" on another frequency. Remember it has to be clear before starting EME! I suggest you take extra care following the steps: The system should be insanely dependable. Be careful in all steps and pay attention to all the details! Just think of it as a little conquest of space: A loose connector can spell the loss of a mars probe... In my case I had to drive 140 miles, which took me 3 hours to solve a problem that took me less than five minutes! In Conclusion a fully flagged remote controlled ham-radio-station is a realistic project to build today. Perhaps it's a way of keeping alive hamradio in times of low RF-radiation-limits and increasing urbanisation.